In recent years, Let’s Plays on YouTube have been majorly popular. However, early access privilege has led to concerns that some Let’s Play content is biased. 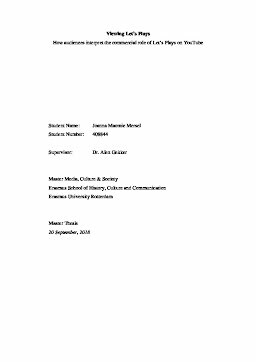 In order to study how viewers interpret the content, this thesis focused on how audiences of early access Let’s Play videos on YouTube interpret the commercial role of the videos. A qualitative approach was taken. The sample existed out of ten early access Let's Plays that were hand-picked based on certain requirements. Five top comments were non-randomly collected from each video, including the nested comments below them. This led to a sample of 543 collected comments, which were then analyzed through textual discourse analysis. A coding frame was created in order to help with this process, which can be explained with the help of precious literature. The results found that a large part of the viewers value early access Let’s Plays on YouTube for the social space that it provides to start discussions and share meanings. Furthermore, many viewers consider early access Let’s Plays to be good tools for gaining knowledge, whilst only a handful of viewers actually use the content to make purchasing decisions. The social community that can be found in the social space of this game paratext can lead to collective practices of meaning making and gaining knowledge. This enhances the gaming capital of the viewers, which defines who they are as gamers, and in turn the feelings of belonging and community strengthens. This type of community and socialization also helps keep the Let’s Play channels alive. Let’s Plays are dependent on the platform and users, and they are also governed by the gaming industry. Comments provided almost no scrutiny of the promotional aspect of the early access Let’s Play videos. Instead, early access preview of games has been portrayed as providers of knowledge and insight that they can use to make meanings and definitions within the social communities. Therefore, audiences interpret the commercial role of early access Let’s Plays as helpful tools to socialize and gain knowledge with. Early access provides a glance of what is new and what is yet to come, and this enhances the viewer’s understanding of games.